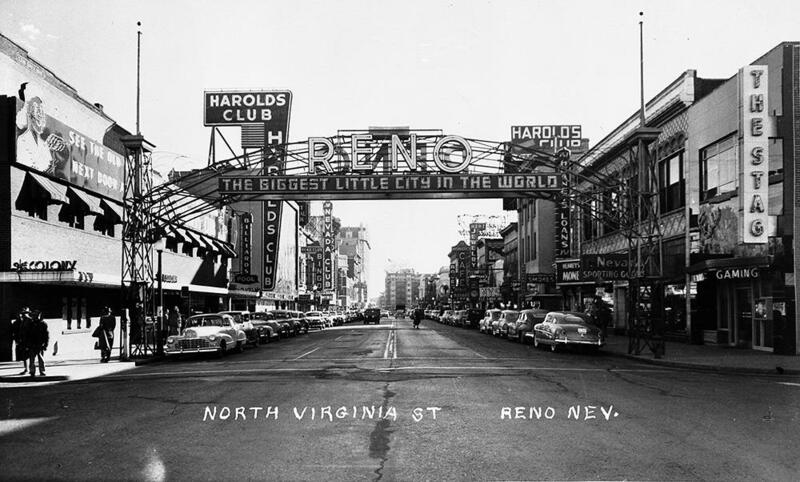 The neon-free Reno Arch installed in 1963 graced Virginia Street until 1987. When it comes to global recognition, nothing says “Reno” more than the famous Reno Arch. There’s been an arch spanning the same spot on Virginia Street, just south of the railroad tracks, since 1926—but not the same arch. Through the years, three different arches have stood there. The first one was meant to be temporary. It was constructed to advertise a five-week celebration for the completion of the Lincoln and Victory Highways, which converged in Reno along Fourth Street. The Reno Arch erected in 1926 remained in place until 1963. When the party was over, residents had grown so fond of the arch that they decided to keep it, replacing its original wording with the single word RENO, and within a few years, adding the slogan “The Biggest Little City in the World.” Green neon lettering was added in 1934, and as Reno became world-famous, the arch did, too. But a few decades later, some began to think that it was no longer the best calling card for the cutting-edge tourist town that Reno had become. In 1963, Roy Powers and Guy Lent were working for Harolds Club, one of Reno’s largest and most popular casinos. Interviewed in 1999, Powers recalled a conversation the two had about the landmark. More modern in this case meant losing the neon. Although considered iconic today, in the 1960's neon was increasingly viewed as dated. The latest rage in signage was backlit plastic, and for the new arch design, each letter in the word “RENO” was spelled out on a bright orange or yellow plastic octagon. Funded by some of the city’s largest casinos, the arch featured 25,000 light bulbs and was completed just in time to welcome in Nevada’s centennial year of 1964. 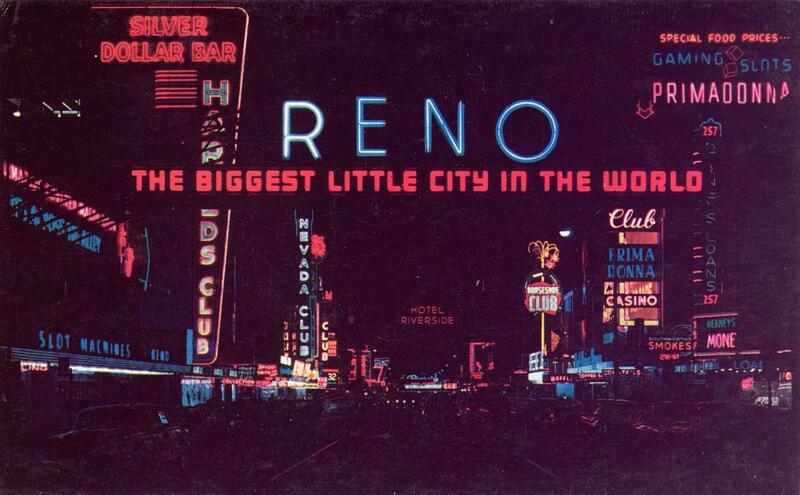 A postcard from the 1960's highlights Reno neon at night, including the lettering on the Reno Arch. Credit Courtesy of Philip Galbraith. That arch electrified Virginia Street until 1987, when it, too, was replaced, this time with a flashy red and gold structure designed to match the glitz of the high-rise hotel-casinos that had grown up around it. The '80s version also brought back the neon—800 linear feet of it. It was recently toned down a bit, repainted and re-clad in a more modest color scheme of blue, silver, and white. As for Reno’s original arch, it journeyed through a series of city parks and storage yards until 1995, when it found a permanent home on Lake Street. There it remains in all its neon glory, a brilliant reminder of how one of the city’s oldest and most dazzling traditions began. Historian Alicia Barber is the editor of the website and smartphone app Reno Historical. Oral history clips for this segment were provided by the Special Collections Department of the University of Nevada, Reno Libraries. You can read more about Reno’s historic arches at Reno Historical.